There are 3 Big ones. But Which one is the best? It might make the difference whether you become so-so welder, or a well paid skilled craftsman in high demand. "Going to Welding School might be the best decision you ever made "
Costs vary greatly but honestly, five years down the road the costs will be forgotten and all that will matter is what you can do. Not what you know. Not how many friends you made. But what you can do. That is what employers pay for and what they want. So let's focus on welding schools that teach you what you need to actually do something when you graduate. I am sure there are plenty of schools doing things right and including pipe welding in the curriculum but for this article I am only talking about the 3 main schools in the US that teach pipe welding tests. There are three main welding schools that focus on training welders to be able to pass welding certification tests as a main goal. And lets face it. If you cant pass the test, you don’t get the job. I went to a welding school that had a focus on teaching how to pass a pipe test. They taught pipe because That is where the money was and back then, they were not constrained by a lot of college rules. Many local technical colleges dont have pipe anymore. They teach welders psychology but not pipe welding. Some are great programs with great instructors. Others have instructors who surf the net. I admire any instructor at a local technical college who pours sweat into the program and really cares. If you can find an instructor who cares at a local college, that might be a great choice for you. After having some experience testing welders who graduated from a local technical college, I personally would be hesitant to select a welding school whose objective it was to make me an "entry level welder". For many local technical colleges, that is exactly their stated objective…to provide an entry level welder. Some Welding Schools need to be overhauled and funded with the right materials to train for welding certification in pipe welding, thin sheet metal, as well as structural welding. Dont misunderstand. I am not against local technical schools at all. I went to one myself. Just make sure its a good one. Again, there are lots of good schools with good instructors out there. Its just hard to verify that prior to signing up. Ask questions. try to talk with a graduate., make some phone calls. Ask about job placement. Local colleges can be a great place to start but you need to know what you are getting for your effort. Tulsa welding , Hobart institute of technology, and the Lincoln welding training program all have welding programs geared toward getting you ready to pass a welding test and get a good paying welding job as a certified welder, not an "entry level welder"
There is a lot of information from Tulsa Students on forums on the web and its not all good. Some students voice the opinion that Tulsa is just a "mill" and only interested in getting tuition money. Others say its good and that the knowledge and training is there if you want it bad enough. I recently visited Tulsa Welding School in Jacksonville FL and was pretty impressed. I even ran into some welding students in the parking lot before going in and asked them about the welding program..."solid program!" is what they all said. Hobart Institute of Welding Technology Has their own version of the structural and master welder programs with tuition comparable to the Tulsa welding program. A great feature of Hobart institute of welding is that they also offer several smaller modules of training courses that are very affordable and very specific like "titanium tig welding"
One particular program that is a tremendous value is their 2 week Basic Tig welding course. This course has no prerequisite and only costs about 800 dollars for tuition. What a great way for someone to dip their toe in and test the water without a big commitment or investment. 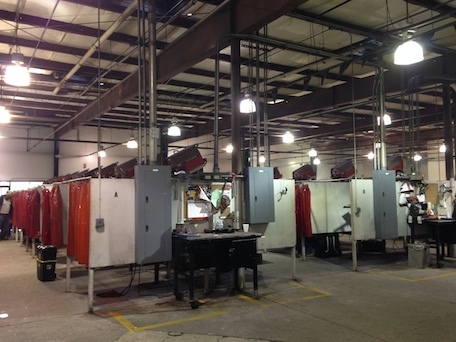 Lincoln's welding program has a Motorsports welding program held at their Headquarters in Cleveland, Ohio. Along with learning from experienced instructors, students will learn side by side with other students who are involved in different aspects of the Motorsports industry, allowing for networking and sharing experiences from the motorsports racing industry. The Lincoln motorsports school is also a good way for someone to test the water before choosing a welding training program. It only costs a few hundred bucks and if you are in the process of visiting welding schools, this is a good option.